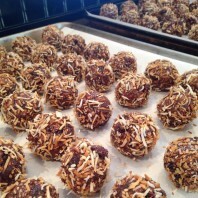 I LOVE that these balls by Whitewater Cooks are FULL of whole foods (and chocolate chips). They are perfect for pre workout or to take on a hike. Combine all ingredients except coconut in a large bowl. Mix everything together well with your hands. You may need a bit more honey to hold it together (I didn’t). Roll 1/4 cup scoops into balls and then roll them in coconut. Store in airtight container in refrigerator for up to one week or in freezer for two months.